Our Team Of Professionals Get The Deals Done! This is yet another example of how the tireless relationship building efforts of our Buyer’s Agents with Sales Agents all around the country, help our clients save thousands of dollars! Euan Rose recently helped negotiate this purchase on behalf of our first time Sydney based client Eamonn. This property was bought directly to Euan’s attention by a Sales Agent he has dealt with on several occasions. The agent expressed their desire to ‘get a deal done’ as they were so happy with how smooth previous PROPERTYOLOGY transactions had been. Euan was advised that the vendors of this property, whilst motivated, were confident of achieving a sale price ‘in the very high $300,000’s’. However, with his personal knowledge of the market and several hours sifting through comparable sales, Euan’s independent market appraisal suggested this well presented, large, 4-bedroom home would only have been astute investing if purchased up to $380,000. Whilst this was within our clients budget and Euan could quite easily have come to an agreement close to the vendors expectations, he leveraged off the relationship he had built with the Sales Agent. He reinforced again, how easy of a transaction this would be for the Sales Agent and the fact that he was working with an astute investor who had finance pre-approved and was ready to sign. Euan made sure that the Sales Agent was aware that this was by no means an emotional decision and he was willing to walk away and find something else for our client if the vendor was not interested in negotiating. 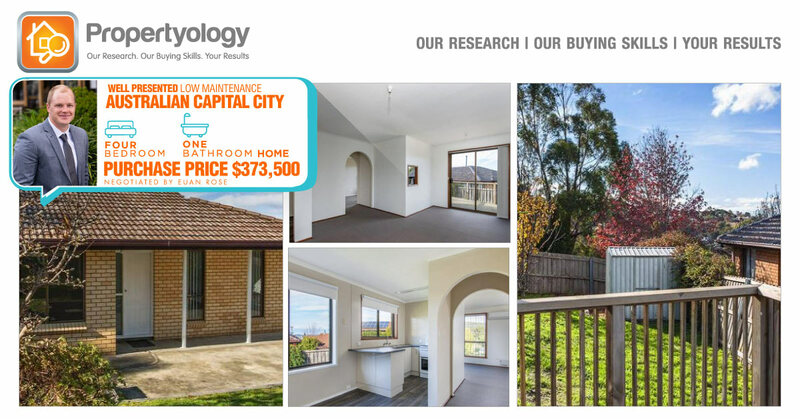 Whether it was the thought of standing around at more open homes, or the thought of potentially dealing with a DIY purchaser who may or may not complete the purchase, the Sales Agent eventually had the vendor accept an offer of $373,500. Significantly under the vendor’s original expectations! We believe this represents an exceptional result for Eamonn who is now officially a property investor! Congratulations again from the entire team at PROPERTYOLOGY!